Whoa, what a trailer. We are still reeling from that intense glimpse of what’s to come for the 6th season of The 100. A new age. 125 years later, everyone is finally awake. We have a new, habitable planet called Sanctum ruled by Teen Wolf‘s JR Bourne and everything is not as it seems. 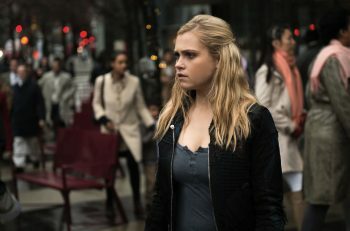 From what we see in the trailer, there is a lot going on when Clarke (Eliza Taylor) and Co. descend onto this new mysterious and dangerous planet. A planet that has two suns? Eclipse-induced psychosis? Madness all around? Clarke in a dress? The drama on The 100 just got a whole lot more crazy. It’s actually a bit weird seeing the gang in a land full of color; it’s a different scenery for sure, but also very beautiful to look at. Let’s not forget the truest MVP Monty Green (Christopher Larkin) — RIP — for working as hard as he could to save his friends and allowing them to the test the waters in a whole new world. However, a whole new world on this show never come easy; there will always be others that won’t welcome them as warmly as they would like. Did I mention the scenery for this new season is stunning? BECAUSE IT IS. Abby (Paige Turco) and Kane (Henry Ian Cusick) are alive and well. Thank GOODNESS. Bellamy (Bob Morley): “You called me every day for 6 years and you left me to die in the fighting pit.” ; Clarke: “I’m so sorry, Bellamy.” These two have some healing to do. Raven (Lindsey Morgan) and Shaw (Jordan Bolger) have my heart! Everyone is tired of Clarke’s leadership. Octavia (Marie Avgeropoulos) has a lot to work on in being on good terms with Bellamy. She needs that redemption. We’ll be at WonderCon this weekend, chatting with the cast and creator about what’s to come in Season 6. For WonderCon attendees, there will be a special screening of the premiere this Sunday in addition to their panel. You can currently get caught up with The 100 on Netflix. Season 6 of The 100 premieres April 30th at 9/8c only on The CW!